Devices are constantly getting lighter and smaller. This creates a problem, people drop them, step on them, or set heavy items on them, which leads to shattered screens and other damages. What is the natural response to broken tablets, phones, or 2-in-1’s with shattered screens?! Consumers go out and spend big bucks on protective gear such as screen protectors, cases, and other accessories to ensure the safety of their beloved device. The Kindle Fire shown below was stepped on so the protective case didn’t help one bit. Is the device worth the repair? Consider if the device is worth repairing. Is it cheaper to buy a new device? Is it cheaper to buy and “new-to-you” (used) device? Is it worth the money to repair if there are cheaper alternatives? With technology changing and improving every day, sometimes it’s worth it to just upgrade. This is especially the case for devices that fall under $100 brand new. If you are repairing flagship handhelds such as iPads, Galaxy Tabs, and Asus Transformers, those are well worth the investment to repair. $50 Kindle Fire’s, not so much. The screen digitizer (the glass layer of the screen that detects the touch) can be half the cost of a new device. This doesn’t include a new LCD screen panel which just adds to the expense. Screen repair is not easy; however, if you have the right parts, tools, access to YouTube, and a whole lot of patience, you can probably do it yourself. This saves you money!.. Many times it’s easier to replace the digitizer, screen, and bezel all in one. 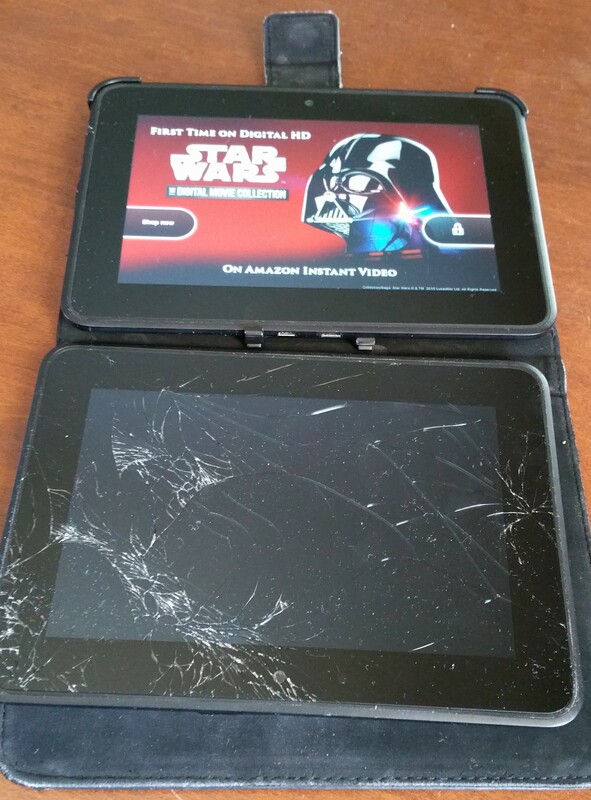 For the scenario pictured below, we repaired the shattered screen on the Amazon Kindle Fire HD 7. Fortunately, the LCD panel was still good. Only the first layer glass (digitizer) was cracked but the screen below appear just fine. We ordered the parts 2 day air and got it swapped out the same day the parts arrived. We’ll admit it was a tough job. We had to use our heat gun to soften the glue between the digitizer and the bezel! All the components tested working and the customer was super happy to get it back in one piece without having to buy a new one and reload all their apps and data on it. How many times have you broken a screen on any device?